So, last week we had a monster hurricane barrel through NYC and last night we got about four inches of snow. I think its clear that mother nature is trying to kill us off one “once in a decade storm that really happen every year” at a time. Don’t get us wrong. We can get down with a little powdery snowfall. But, we prefer it when there is a board strapped to our feet. Other than that we really don’t see much use for it. Its really pretty for the first hour, but once New Yorkers start stomping around it and dogs start peeing on it, it quickly turns into a dangerous pile of yellow and muddy ice. Certainly not the stuff that Christmas movies are made of. 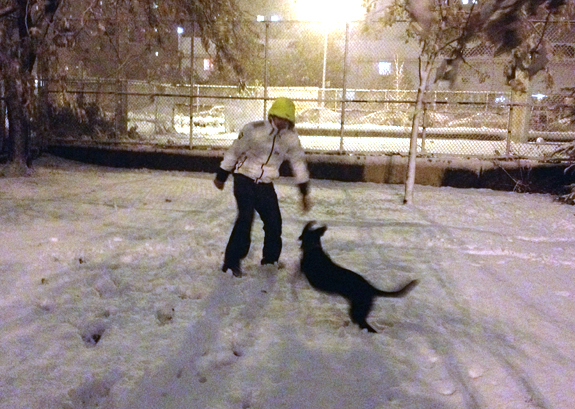 Given this will be our last – fingers crossed – snowfall for a looong time, we took a break from packing, headed outside, strolled hand in hand, watched the twinkling flakes fall, and had an unfair snowball fight with the pups. It was incredibly funny to watch Riley try and figure out what the heck all this cold stuff was under his feet, and even funnier to watch him try and chase the snowballs that would break up after Jason threw them. Please do not judge my videographer skills here. I know they are less than desirable – I’ll work on it! I love how Dewey walks into the shot and literally pisses on Riley’s parade. Meanwhile, it is supposed to get up to 66 this weekend – what are you doing to us Momma Nature? !